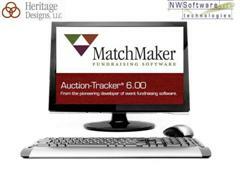 This demonstration will show the ease of transferring complex data from MatchMaker FundRaising Software to Auction-Tracker v6.00 and back to MatchMaker FundRaising Software without using cumbersome import/export files. This is a true integration. Join us to see how we can enhance the ease and efficiency of your next auction event. Northwest Software Technologies, Inc. is the pioneering and leading provider of fundraising event software to the nonprofit sector in the United States and Canada. More than 2,000 organizations worldwide – including the Juvenile Diabetes Research Foundation, National March of Dimes, Cystic Fibrosis Foundation, Boys and Girls Clubs of America, and Rotary International – use the Tracker-Series applications to manage fundraising events. Northwest Software Technologies offers four software applications: A’Thon-Tracker™ for sponsor-based pledge type events, Auction-Tracker® for fundraising benefit auctions, Banquet-Tracker™ for fundraising banquets and Tournament-Tracker® for benefit golf tournaments. Founded in 1985, Northwest Software Technologies is headquartered in Everett, Wash., with international distribution offices in Canada and Australia.